The Blessed Theresa Society, named after the School Sisters of Notre Dame’s foundress, Blessed Theresa of Jesus Gerhardinger, recognizes individuals and families who have made a long-term commitment through a planned gift. This legacy society provides a way for us to recognize and thank donors who have named SSND in their estate plans. As a member, you will receive a certificate, be recognized at our Mass of Appreciation (if desired) and be remembered in special prayers throughout the year. Most importantly, you will help ensure that the SSND mission and ministries continue for generations to come and retired sisters receive quality care. If you have already remembered SSND in your estate plans, please contact Director of Resource Development, Mary Kay Murray, at 262-787-1037 or email mmurray@ssndcp.org so she can extend our appreciation and welcome you to the Blessed Theresa Society. Adding the School Sisters of Notre Dame in my will. Planned giving that may benefit me now and/or in the future. 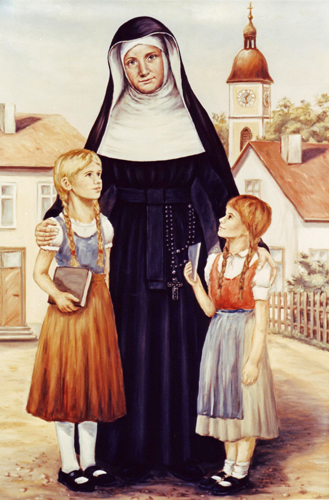 Sharing my intentions to add the School Sisters of Notre Dame to my estate plan.